What the blurb says: “Maine game warden Mike Bowditch returns home one evening to find an alarming voice from the past on his answering machine: his father, Jack, a hard-drinking womanizer who makes his living poaching illegal game. An even more frightening call comes the next morning from the police: they are searching for the man who killed an esteemed local cop the night before – and his father is their prime suspect. Jack has escaped from police custody, and only Mike believes that his tormented father might not be guilty. 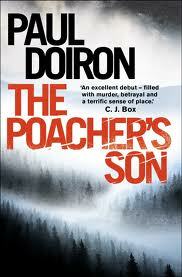 The Poacher’s Son is Paul Doiron’s debut novel and the first in the Mike Bowditch series. It won the Barry Award and the Strand Critics Award for Best First Novel. Mike Bowditch stands for everything his father doesn’t: honour, care of the natural world, and the overriding need to ‘do the right thing’. He’s carved out his own niche in the world as a game warden and even when his relationship doesn’t work out the way he’d hoped due to the demands of his work, he’s still determined and passionate about his job. But, just like years before when Mike was just a kid staying with his father for the summer, his father’s actions pull Mike into a world that he doesn’t want to be involved in. Torn between the loyalty he feels towards a father than never earned it, and the job he loves and colleagues he respects, Mike is forced to make increasingly difficult choices in order to ensure his father gets a fair deal. As well as a plot thick with twists and turns, this book showcases the forests and natural habitats of Maine so vividly that the setting of the story becomes almost like a character in its own right. What’s great about Paul Doiron’s writing is that you get a terrific sense of place without any slowing of the story. With a cast of engaging characters, each with their own very particular view on the situation Mike finds himself in, and many with a reason to not be entirely truthful about what happened, I found myself rooting for Mike from the beginning. Action packed and emotionally powerful, this atmospheric thriller had me gripped. York Festival of Writing: the book!